Shinichi Suzuki was not only a violinist, but also an educator, humanitarian and philosopher. Suzuki was born in Nagoya, Japan, the son of a violin maker. 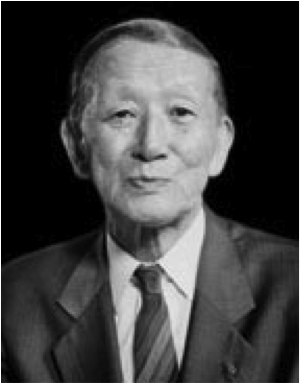 After WWII, Suzuki began to focus his teachings and educational philosophy on children; he founded a school, Talent Education Institute, in Matsumoto, Japan, based on the premise that talent is not inborn but that any child can acquire ability.The Suzuki Method begins with the premise that music is to be enjoyed. All children have musical potential that can be developed, given the proper instruction and environment. Children will strive to learn in an atmosphere of love, encouragement and enthusiasm. Suzuki’s aim was never to produce professional musicians but to expand children’s sensitivities, self-esteem, discipline, determination, and cooperation “ thereby making noble human beings” of all children. Every Child Can Learn Children can speak and understand their native language at a very young age. Similarly, children can easily learn music though this same process of listening and repetition. Loving Environment Learning requires an environment in which the child is nurtured by love and encouragement. A caring and cooperative environment promotes growth and learning in children. Parental Involvement Children can sustain greater interest and can progress more rapidly with a participatory parent. Parents attend all lessons with their children and direct the home practice of their children. No prior musical training is needed. Step-by-step Mastery Each skill is broken down into its smallest steps. The child progresses at his/her own pace. Each step is easily assimilated and repeated many times before continuing, ensuring the success of the child. Enthusiasm and Fun Children progress more quickly in a non-stressful environment and with enthusiastic teachers/parents who demonstrate the fun of learning music. Listening Children’s ears are trained for musical sounds by listening daily to tapes or CD’s of the Suzuki repertoire. Repetition Daily practice, as with language learning, is necessary for progress. To enhance technical skill and musical expression, the child continually refines past pieces. Memory and Music Reading With language, children learn to speak before they learn to read. Similarly, children learn to play from memory prior to reading music notation. Group Lessons Group classes provide fun opportunities for children to play with and learn from other children at slightly different skill levels.